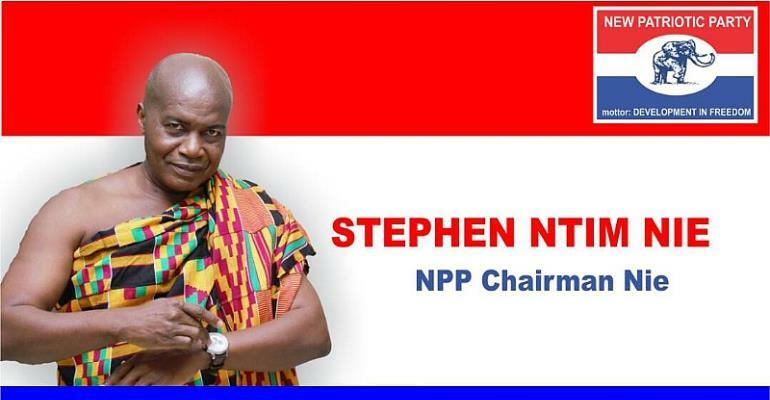 A former Central Regional Chairman of the Ruling New Patriotic Party (NPP) Mr. Joseph Danquah Smith, affectionately called “Butey” has thrown his weight behind Mr. Stephen Ntim for the National Chairmanship position in the upcoming NPP National Delegates' Conference. In an exclusive interview with the New Crusading Guide, Mr. Danquah Smith believes Mr. Stephen Ntim has what it takes to be the National Chairman of the great elephant party. According to him, Stephen Ntim has worked so tirelessly when he was the National 1st Vice Chairman of the party in the erstwhile John Agyekum Kufour's administration, got in close contact with the grassroots members, sort their advice, resourced them to embarked upon effective campaigning which helped the party at the constituency, regional and national levels. Mr. Danquah Smith also believes that with the experience that Mr. Ntim has obtained in politics, the time has come for delegates to decide on him who have also spent his resources and provided logistics even when the party was in opposition. “He is very accommodative and listens to concerns of members of the NPP at the grassroots, constituency, regional and national levels when they are aggrieved.” He said. Mr. Stephen Ntim is believed to have chalked many successes and made significant achievements for the party when he was the National 1st Vice Chairman. To Joseph Danquah Smith, nobody should even contest Stephen Ntim since he has suffered enough for the party. He averred that they are all going out to tell the party and the new ones who have joined the party about Ntim. “To me if not democracy, this man should have gone unopposed.” He said. He was Co-ordinator of Traditional Rulers Project along with Hon. S.K. Boafot, 2012 Campaign, Middle-Belt Sector Co-ordinator of Nana Akufo-Addo's primary election, 2014, Chairman, B/A Conflict Resolution Committee, 2012 Campaign, Member, B/A Regional Finance Committee, 2012 Campaign and Chairman, Headquarters Fundraising Committee in 2014. He was also the Co-ordinator of the Settler Communities Project in the 2016 Campaign, and represented the NPP in Dresden, Germany, in 2002 to deliver a paper that led to the eventual admission of the party into the International Democratic Union (IDU). Stephen Ntim also represented the NPP at a conference of the Democratic Union of Africa (DUA) in Maputo, Mozambique and was once a Polling Agent in the 2016 elections at the Methodist School Polling Station, Wamfie, Dormaa East Constituency, B/A. Stephen Ntim single-handedly provided 14 vehicles to the party in 2004, one to each of the ten (10) regional secretariats, and four (4) constituencies, while serving as the National First-Vice Chairman. He has been supplying personalized call-cards to all constituency and regional officers every four years, irrespective of whether he wins or loses elections over the years. Mr. Ntim has been providing personalized letterheads to all constituency and regional offices every four years at no charge, whether he is voted for or not and has provided free party ID cards to the party Headquarters in 2004. He has been assisting needy parliamentary candidates with campaign materials, especially posters, sample ballot papers and other logistics during all election periods, including by-elections whilst providing standard building plans to all constituency offices in 2004, as an initiative to encourage all constituencies to put up their own constituency offices in 2004. Additionally, he adopted the entire Volta Region by providing seed money to each of the then 19 constituencies, for the purchase of a building plot since there was no sitting Member of Parliament in any of the constituencies within the region at the time.